Here’s our recap on the design conference Dwell on Design 2014, held at the Los Angeles Convention Center in Southern California from June 20 to 22. The show is put on by the publication Dwell Magazine and features design, home improvement, interior designers, innovative products, home technology, architecture and more. Dwell On Design is about innovating the way in which we live and how we interact with products. Of course, while there, we took note of some beautiful and innovative range hoods. First on our list is this unique range hood from Miele. The Miele brand originated way back during the early 1990s in Germany. Miele prides itself upon its high quality products and emphasis on sustainability. This range hood is sleek and modern; it looks like a light fixture that hangs above the cooking surface. The Miele booth was decked out in modernized kitchen products. This kitchen range is flat with precise temperature control. It includes three large burners and two smaller burners. These ranges are easy to clean; once the surface has cooled down, it can be wiped down. These ovens from Miele include analog and digital clocks. The sleek design and reflective surface are very apparent in this photo. These kitchen appliances from Panasonic have futuristic, purple surfaces that makes the set look recognizable and interconnected. Photographed here is an electric kettle, a toaster and a coffee pot from Panasonic. The promotional cookies on the kitchen counter were a nice touch as well. The photos above feature beautiful outdoor kitchen set ups, including a barbeque. Who wouldn’t love to cook in these outdoor stainless steel kitchens during the summer months? All you would need is some outdoor furniture to compliment the kitchen and to give you and your guests a place to enjoy your meal. These dimmers and light switches from Adrone really make an impression and give the customer options for making the light switch match his or her home remodel. Who says light switches have to be boring? Well, they don’t have to be anymore with these light switches, which include different options for controlling the lights (which is evident in the photo). The Harmonia range hood from Best impressed us with it’s elegant touch controls. We also took note of these interesting range hoods from best, which are just as decorative as they are functional. Lastly, this range hood from Best is mounted inside of the ceiling for subtle kitchen ventilation above the cooking surface. We enjoyed walking through the interior design above from Organic Modernism. We love the contemporary and elegant use of the antlers. These lamps from Itsara [K]oncepts look more like sculptures than desk lamps. These fixtures come with decorative panels that snap together using magnets. We were pleasantly surprised by the decorative pieces from Vita Vino Wine Barrel Décor. These metal and wooden sculptures are pieced together using pieces of retired wine barrel. That’s it for our recap on Dwell on Design 2014. We can’t wait for next year! This entry was posted in Kitchen Design, Range Hoods and tagged dwell, dwell on design, dwell on design 2014, interior design, los angeles, miele, range hoods, southern california on June 30, 2014 by editor. Shop Somewhere Else for Range Hoods? Shop somewhere else for range hoods? I don’t think so, Tim. This entry was posted in Range Hoods and tagged funny, home improvement, humor, range hoods, tim allen on June 27, 2014 by editor. We all know breakfast is the most important meal of the day. Sometimes it can be hard to prepare it in time or to decide what to cook. We’ve compiled a list of four recipes for you to try. You can also check out our last blog on cooking: Father’s Day Recipes. Muffins are a type of quick bread made out of a batter. The word muffin comes from the French word “moufflet” for bread. Peanut Butter Chocolate Chip Muffins from Chez Catey Lou is a quick breakfast food you can bake in five minutes. 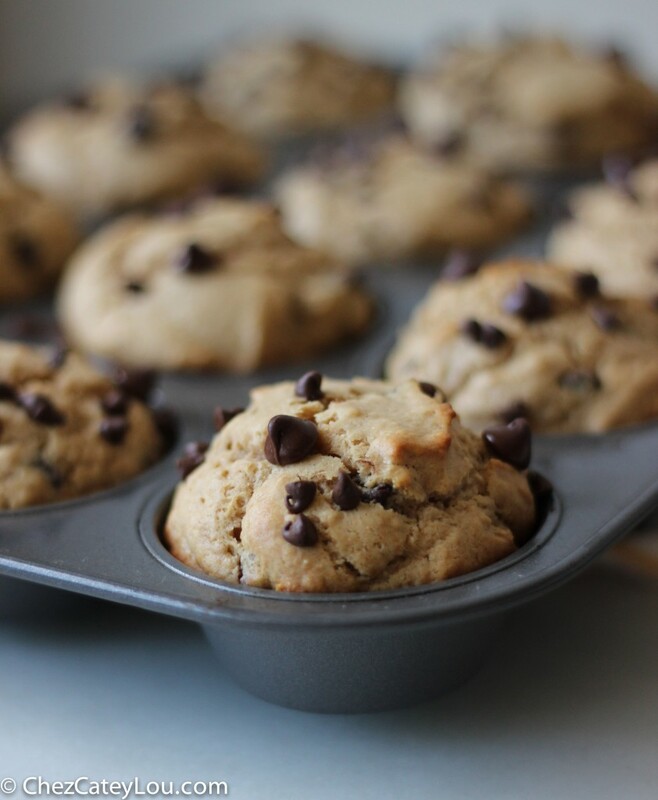 These delicious looking muffins contain all purpose flour and whole wheat flour, peanut butter, brown sugar, unsalted butter, chocolate chips, etc. The peanut butter will supply you with energy while the chocolate will boost your endorphins in the morning. Sprinkle these muffins with additional chocolate chips before putting them in the oven. Enjoy them with some peanut butter or jelly on top. Cinnamon rolls originated in Sweden; Sweden even has a day every year dedicated to cinnamon rolls. Their version is not as sweet as the American version, which most likely originated in Philadelphia. 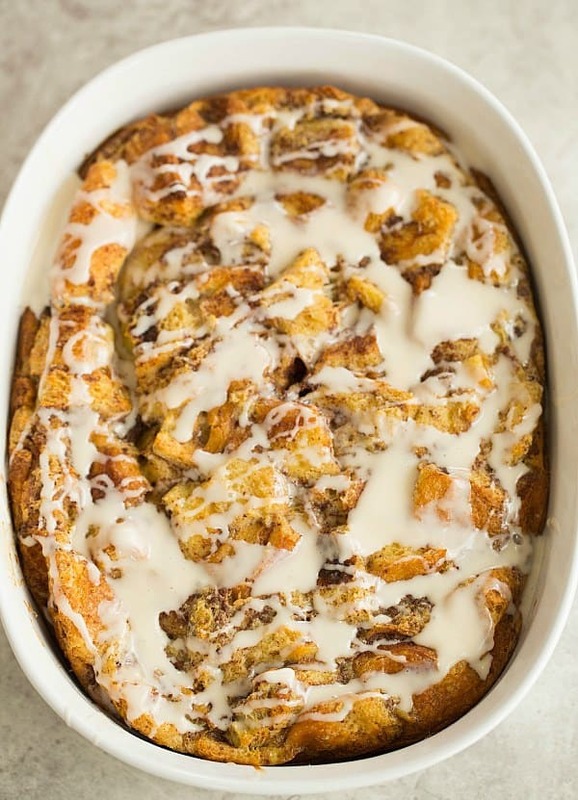 Cinnamon Roll Bread Pudding Breakfast Casserole from the Brown Eyed Baker is a new take on a bread pudding. In place of bread, this recipe calls for chunks of cinnamon rolls. The whole casserole is topped with delicious cinnamon roll icing. Who wouldn’t want this for breakfast or dessert? The cinnamon roll chunks are soaked in a custard mixture. Michelle recommends letting the cinnamon rolls get stale first. It’s believed the breakfast sandwiched appeared in the United States during the 19th century and that it was popularized following the Civil War. It was first served as a fast food item by McDonald’s in 1972 when Herb Peterson, an advertiser, was inspired to create the sandwich by his love for Eggs Benedict. Moving on from the sweet recipes to the savory ones, the next breakfast recipe on the list is The Best Breakfast Sandwich! from Framed Cooks. This breakfast sandwich looks as good as its name sounds. The recipe calls for a cheese sauce, so both the egg and the cheese will be soft in the sandwich. (The recipe calls for sauce made out of Velveeta, flour and milk). The Best Breakfast Sandwich! 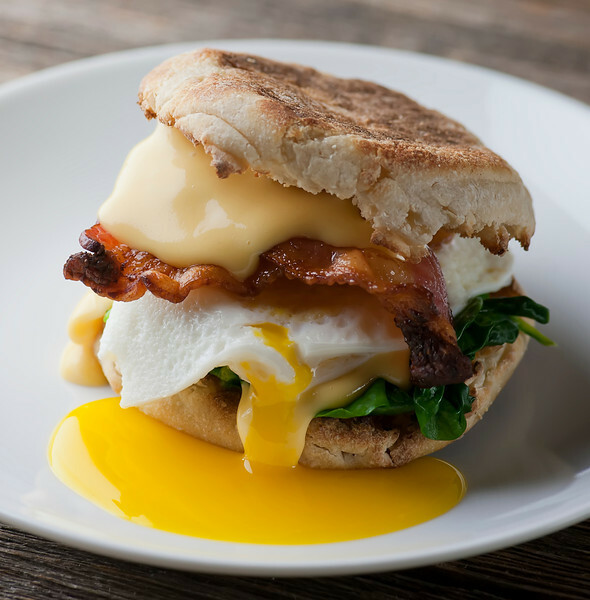 includes sautéed spinach, bacon, egg and cheese sauce in between an English muffin. The word omelette comes from France during the 16th century. The story goes that Napoleon was served an omelette for the first time at an inn in the town of Bessieres. The next day, Napoleon ordered the town to cook an omelette large enough to feed his army. Omelette Roll is from Mom’s Dish, written by Natalya Drozhzhin. Baking an omelette with a mixture of eggs, flour and milk looks a lot easier than babysitting an omelette in the pan. This recipe also has a “wow factor” going for it because it looks so unique. Natalya promises the Omelette Roll is really easy to prepare. She sprinkled the omelette mix-ins on top of the egg mixture in a flat pan and baked it for 14 minutes. Then, she rolled it up and served it. We hope you enjoy trying these recipes for breakfast. This entry was posted in Food, Recipes and tagged Breakfast, breakfast sandwich, cinnamon roll, eggs benedict, food, Herb Peterson, McDonald, omelette, peanut butter, recipe on June 26, 2014 by editor. For this week’s Kitchen Tech Wednesday, we interviewed Stefano Marangoni, the Team Leader behind Thingk’s GK series. The GK series includes GKILO, a smart food scale, and CLOGK, a smart kitchen timer. You can read last week’s Kitchen Tech Wednesday blog post here: Kitchen Tech Wednesday: SodaStream. Range Hoods Inc interviewed Stefano Marangoni, the Team Leader at Thingk. Stefano and his colleagues at a hi-tech multinational company came together. They built a team of technology gurus, engineers and designers to create GKILO and CLOGK. 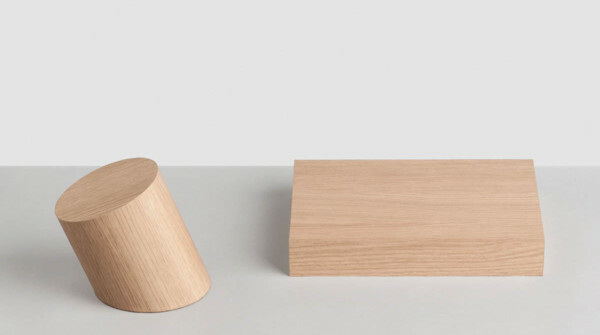 GKILO is a wooden food scale with a LED display that appears when you touch it. When it turn it over, the display becomes a clock. CLOGK looks similar but is a timer. Range Hoods Inc: Please explain how the devices are designed to be wireless ready, such as the wireless module built-in. Also please explain the wireless add on. Stefano Marangoni: The production of a high quality product, with high design, good materials and a modern user experience, is very expensive and the cost of the single product depends a lot on the production volume. For this reason, we declared a stretch goal in our campaign: with $200,000 USD, we will include in our products a wireless module that completes the functionality of the devices. The wireless add-on is based on Bluetooth technology, which has low power consumption and is included in all smart phones. In the case of the $200,000 USD goal, we will include in our products a module developed by our team. As of now, we are at about $50,000 USD, so we do not have enough budget to develop the custom module. However, we designed our products to be wireless ready: in our PCB core we have a USB port, driven by a FTDI chip. Thanks to this, we can manage serial communication. Thus, if one of our customers wants to add the wireless functionality, he or she can buy a module. We are developing firmware to manage this communication, and we will be happy to share the firmware with our customers. RHI: Where did you get the idea for a device that looks like a decoration or paper weight until it is touched for use? Stefano: We believe in Open Design, and we think this “philosophy” will change the role and the working method of tech companies. For this reason, from the beginning, we involved our network (designers, geeks, but also common people) to understand their needs and to collect suggestions on the best user interface. Then, and this was the most difficult part, we worked to give a natural touch to our products. We were inspired by the concept of Animism, so we tried to create devices that seem natural and totally unanimated; only when you touch them, they switch on and show their functionality. RHI: Will customers be able to pull up recipes in the mobile app? Stefano: We are working on the app development, and we are open to suggestions. For example, some backers asked us to introduce an “automatic scaling” of the ingredients. In a recipe, you have the quantities for a certain number of people. However, sometimes you want to cook smaller quantities, so we are developing a function in the app to give you the ability to weigh one ingredient and automatically scale the other ones in the recipe. We are also talking with our colleagues from “Oh my Cook!” in Polihub (the start up incubator we are in) to integrate recipes in our mobile app. RHI: What future projects does THINGK hope to accomplish? Stefano: We want to introduce one series per year, exploring all the range of everyday objects and try to innovate them. We are working on a mirror, which will be able to give you useful information and on a pillow that detects when you are asleep and that is able to switch on and off electronic devices and lights. It will also monitor your sleep/wake cycles. And we are also working on a disruptive device, but I can’t tell you anything more: it’s an early stage project! However, beside single devices, our goal is to revolutionize the segment of everyday products, introducing a new way of thinking in this category. RHI: Where does THINGK see the human-machine relationship going and progressing? Stefano: We started with servers, then we introduced the Personal Computer; in the last decade smart phones have become a fundamental piece of our everyday life. Now, every new version of a traditional tech object is improved with Internet functions: smart TVs, cars. It’s only a matter of time, but humanity tends to be more and more surrounded by technology. It’s normal: we are the smartest and the more social animal species, and we cannot accept anymore to interact with objects that are not smart and not “social” or connected each other. Intelligence and sociality are part of us and we tend to construct a world that is similar to us. We hope you’ve enjoyed this in-depth interview with Stefano from Thingk. What is your favorite smart technology? This entry was posted in Kitchen Tech and tagged bluetooth, clogk, gkilo, indiegogo, range hood, range hoods inc, stefano marangoni, technology, thingk on June 25, 2014 by editor. Last week we discussed Kitchen Tech Wednesday: Mellow Smart Sous Vide Cooker. This week we’re going over a popular home appliance that is relatively new: the SodaStream. How much money a year do you spend on soda? Also, how many calories a year do you think you consume from soda alone? The SodaStream is a countertop soda maker for soda lovers that are sick of buying bottles of soda from the store and/or want to have a healthier alternative to soda in their homes. You may have seen the Super Bowl ad for SodaStream, featuring Scarlett Johansson. To use a SodaStream, you fill the bottle it comes with with water and let it cool in the fridge. When it’s cold, connect the top of the bottle to the SodaSteam unit and fill it with the amount of carbonation you prefer. Then, you add the flavoring to your soda. Currently, Amazon is offering a $20 rebate on SodaStream models until August 31, 2014. The SodaStream works with the use of a carbon dioxide canister. This canister must be replaced or refilled after you use it on 60 liters of soda. Customers can trade out their canisters for $15 at retailers, such as Target, Williams-Sonoma, Bed, Bath and Beyond and Sur La Table. This means you will have to spend more money on the SodaStream throughout its lifetime. The SodaStream Source model, pictured in this blog post, is a popular choice and was designed by Yves Behar. Even though you have to purchase canister refills and soda syrups, using the SodaStream means spending less money on soda from the store overtime. Additionally, you won’t have to transport the soda, store it or store the empty bottles for recycling. SodaStream also sells syrups for flavoring the soda; many of their syrups emulate the name brand sodas, such as Coca Cola, Sprite and Red Bull. These versions contain no high fructose corn syrup and less sugar and calories than the regular versions of name brand sodas. However, owning a SodaStream does make it easier to create bigger servings of soda, which will mean you’ll be consuming more sugar on a regular basis. Some families choose to purchase a SodaStream simply for the ability to make their own sparkling water and seltzer. For a sweeter taste, you can add fruit juice or simply add lemon juice to the sparkling water for an alternative to soda or coffee. Lastly, the SodaStream is a more sustainable option when compared to buying soda in bottles or cans from the store. The empty bottles and cans leftover from drinking soda create waste. The SodaStream uses one, BPA free bottle for storing the sparkling water. You can purchase additional bottles if needed. Do you own a SodaStream? Let us know what you think. This entry was posted in Kitchen Tech and tagged appliance, kitchen, scarlett johannson, soda, sodastream, soft drink, technology on June 18, 2014 by editor. It’s summertime, and it’s time to take out those tongs for grilling. Grilling is a great way to cook vegetables so they will retain the nutrients and vitamins that make them so healthy. Boiling vegetables is effective, but drains the vegetables of their nutrients. For other articles about food, see Top 5 Super Foods: Fruit Edition. Vegetables are delicious and healthy. They are low in calories and fat and full of antioxidants and phytonutrients. If you’re not sure which vegetables to grill, look for vegetables that are in season and are grown locally. To properly cook vegetables on the grill, make sure the vegetables don’t end up stuck on the grate. Use a non-stick cooking spray on your grill so the vegetables will easily come off. Other methods include wrapping the vegetables in foil or placing them in a specialized grilling basket. Before putting vegetables on the grill, think about how you would like to season them. For a simple version, coat them in olive oil and season with salt and pepper. Lastly, make sure you turn on the range hood while cooking. If you’re cooking on the stovetop in your kitchen, turn on your range hood. If you’re grilling outside, turn on the outdoor range hood if you have one. This green vegetable is full of antioxidants, vitamin E, beta-carotene, manganese, vitamin C and glutathione. It has anti-inflammatory properties because of the flavonoids and saponins it contains. Asparagus has also been used medicinally throughout its history and it is known as a diuretic. It is believed its glutathione content gives it the power to remove toxins from the body and prevent cancer. Asparagus also contains fiber, folate and vitamin B12. Zucchini is a green squash that is shaped like a cucumber. It contains antioxidants, potassium, vitamin A, protein, fiber, vitamin C and folate. It improves the body’s immunity, potassium helps the issues within the body and fiber improves the digestive system. Onions may seem like a garnish or an element that is an add-on to a meal. For example, onions by themselves do not usually make a sufficient side. However, that doesn’t mean onions aren’t nutritious. They contain anti-inflammatory agents, they fight infections and they increase immunity. They contain phytochemicals, chromium, and quercetin. It is thought onions increase beneficial cholesterol, that they regulate blood sugar and that they prevent cancer. Bell peppers are a sweet vegetable. The level of sweetness depends upon the color. Green bell peppers are the least ripe and red bell peppers are the ripest versions. Bell peppers have low fat content and contain antioxidants, vitamin C, vitamin E, lycopene and beta-carotene. Additionally, the fiber in bell peppers help the digestive system and the vitamin C helps fight infections. Tomatoes were once thought to be poisonous during history; they are a member of the nightshade group of vegetables. Today, we know tomatoes contain antioxidants, carotene lycopene, vitamin C and vitamin A. They are thought to prevent cancers, including prostate cancer, to improve urinary tract health and to protect skin from the sun’s rays. Have fun grilling these colorful and healthy vegetables! This entry was posted in Food, Range Hoods and tagged antioxidant, asparagus, bell pepper, cooking, food, grill, kitchen, onion, range hood, range hoods, vegetable, vitamin, zucchini on June 16, 2014 by editor. My Steel Range Hood is Just too Powerful! I can’t smell the delicious meal for one I just cooked myself. My steel range hood is just too powerful! This entry was posted in Range Hoods and tagged cooking, first world problems, funny, humor, kitchen, meme, range hood, range hoods on June 13, 2014 by editor. Father’s Day is almost upon us and what better way to honor Dad than with his favorite dishes. Food blogs around the Internet seem to agree what dads need is beer, bacon, meat and rich, creamy baked goods. Check out our post Mother’s Day Recipes as well. Jessica writes on Tinkerbean about the projects she does with her son. She’s also a dietitian, so she tries to integrate healthy foods into the projects. In this Father’s Day project, Jessica and her son used cheddar cheese, bell peppers and a fun assortment of crackers to create shirt and tie cheese and crackers. The cheese goes on top of the crackers and bell peppers are cut into ties for the cheese shirts. This is definitely a universal symbol that says “Happy Father’s Day!” It’s also a simple project kids can easily help out with and present to dad. What dad won’t love meat grilled with a whiskey marinade and with lots of garlic and sea salt potatoes? This marinade is made with whiskey, brown sugar, pepper, salt, oil and garlic. The marinade is later used to create a sauce for the entire meal. The potatoes are cut into wedges and simmered in salt water until done. They are then coated in olive oil, chives, vinegar, pepper and salt. This is the perfect meal to enjoy with dad this Sunday. 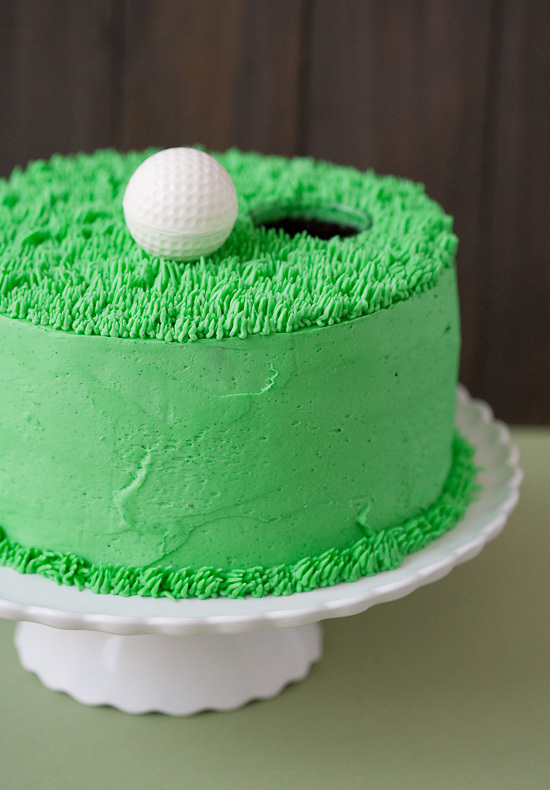 Lindsay, co-author of Love & Olive Oil, made this amazing golf cake for her father’s birthday. All dads love cake, right? This cake is made with stout beer in the cake batter and with dulce de leche and vanilla buttercream in between the cake layers. Even the golf ball on top of the cake is edible (it’s made out of white chocolate). The chocolate cake in this concoction is made out of the beer, cocoa powder, sour cream and all of the regular cake fixings. The vanilla buttercream frosting includes vanilla bean and vanilla extract. The dulce de leche adds an extra, sweet element. Lindsay made a golf hole in the cake using an ordinary shot glass. When Kim, of The Celebration Shoppe, asked her sons about their father, they agreed that he loves to work in their yard. Therefore, she decided to create cupcakes with lawnmowers on top of them for Father’s Day. The lawnmowers are made almost entirely out of chocolate, including M&Ms, Hershey’s mini chocolate bars and chocolate sixlets. The cupcakes really are creative; she piped tall, green grass on half of each cupcake and frosted the other half with a flat green, so it looks like the chocolate lawnmower is actually mowing the top of the cupcake. We hope you have fun cooking this weekend. Happy Father’s Day 2014! This entry was posted in Food, Range Hoods, Recipes and tagged beer, cake, chocolate cake, cooking, cupcakes, dulce de leche, father's day, food, Meat, range hood, range hoods, recipes, stout on June 12, 2014 by editor.